There is no tragedy greater than the horror of little children literally starving to death because there is nobody to feed them just a few morsels of bread. The photo of a toddler, crouched in the final pangs of starvation, and waiting to be devoured by a vulture that has sensed his impending death, was so shocking that it moved the whole world. Photograph by Kevin Carter (13 September 1960 – 27 July 1994). Carter was an award-winning South African photojournalist. He was the recipient of a Pulitzer Prize for his photograph depicting the 1993 famine in Sudan. He committed suicide at the age of 33. Portions of Carter’s suicide note read: ‘I am haunted by the vivid memories of killings and corpses and anger and pain…of starving or wounded children, of trigger-happy madmen, often police, of killer executioners’. Yet this was only one image. Similar images in other circumstances – of children screaming in unbearable pain of hunger – go unnoticed and unknown to the rest of the world. I wish everyone could hear the groans of starving children and their pleas for a mouthful of food, as I have heard in my travels to countries where innumerable kids in each city go to sleep every night on hungry stomachs. Just to cite one encounter of the uncountable many I have had, I was on my way to board a train in a small city. As I passed by the entrance to the station, I heard the loud wailings of a child, and turning to look, saw a 6 or 7 year old child lying on his mother’s lap. She was sitting on the pavement of the entrance. I stopped and went over to them, and asked the mother why the child was crying. ‘He is asking for food’, the mother said, with a smile of hopelessness. Normally, in such situations in the past, I had purchased food and handed it to the hungry ones, instead of giving them money. But I had to catch my train, and I gave the mother some money enough to buy food for both. I did the best I could in my jobless situation in those days, but the memory of this encounter still grieves me, 30 years later, and whenever the image of the wailing child comes to mind, I wonder if the mother was able to feed her child with daily bread until he was old enough to get his own food. I have had too many such heart-excruciating encounters, and these experiences has given me an acute awareness of the real state of this world’s afflicted ones, and a great longing to do something about it. 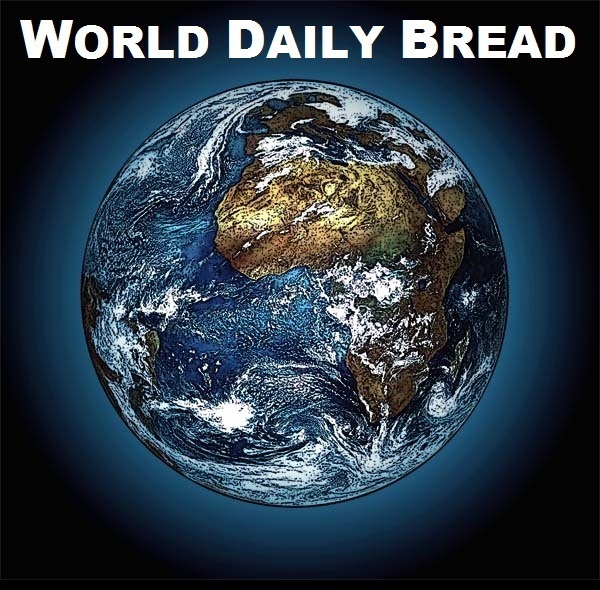 This mission is a result of that great desire to do something to bring daily bread to the hopeless hungry people of the world. If all the nations in the world had joined hands to fight global hunger, I would not have heard the wailing of a starving child in any of my travels. 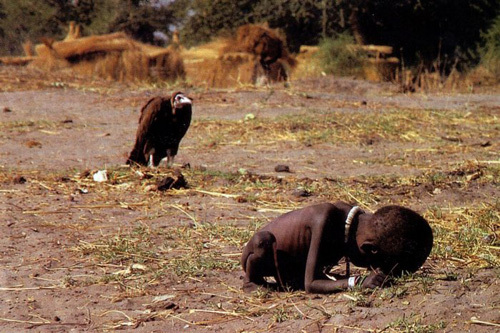 There would have been no Pulitzer Prize winning photograph of a dying toddler with a waiting vulture in the background. Because, if all the leaders in the world put their heart to it, they can have food to feed the world’s entire population one and a half times over! ‘The depth of the global food crisis is best expressed by what poor people are eating to survive. ‘In Burundi, it is farine noir, a mixture of black flour and moldy cassava. In Somalia, a thin gruel made from mashed thorn-tree branches called jerrin. In Haiti, it is a biscuit made of yellow dirt. Food inflation has sparked protests in Egypt, Haiti, Mexico and elsewhere. Tens of thousands protested earlier this month in Mogadishu, as the price of a corn meal rose twofold in four months. ‘And while the crisis seemed to come out of nowhere, the reality of hunger is a regular feature of life for millions of people. 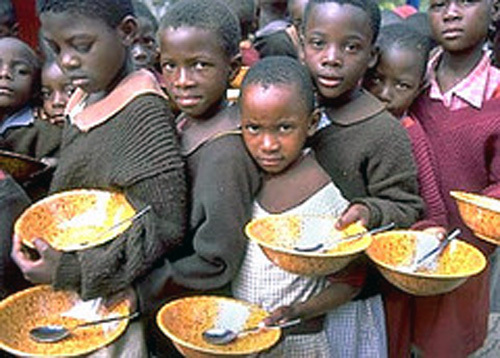 The United Nations’ Food and Agriculture Organization estimates that 854 million people worldwide are undernourished. ‘The technology and knowhow exist to make our capacity to produce food even greater – if this were made a priority. ‘International ‘aid’ is organized around the principle not of solving poverty but of making profits – and in the process, it usually leads to more suffering. In Ethiopia, the poverty ‘experts’ at the World Bank forced the country to devote good land not to food crops, but to export crops to sell on the world market. As a result, the famine of the 1980s were made even worse. ‘These crises aren’t aberrations, but are built into the system. A recent Time magazine article grudgingly commented, “The social theories of Karl Marx were long ago discarded as of little value, even to revolutionaries. But he did warn that capitalism had a tendency to generate its own crises.” The Time article was titled ‘How Hunger Could Topple Regimes’. ‘There is enough food grown in the world for everyone. And yet we remain stuck in a food crisis. Half the world’s food is lost as waste and a billion people – one in every six of the world’s poorest – cannot access enough of the other half and so go hungry every day. ‘The Millennium Development Goal to halve hunger by 2015 will be missed without more action – and now a new pledge will be tabled to eradicate it totally by 2025. ‘To do so, leaders must concentrate on helping poor farmers who have been left to fend for themselves on the front-line of hunger, poverty and climate change. Three out of every four poor people depend on agriculture, so that is where global poverty must be tackled. In addition, small-scale farmers hold the key to increasing global food production in a sustainable way that could cope with climate change. The script is pretty straightforward. ‘All countries must invest more in small-scale agriculture, particularly to women who play a vital role in food security, yet who have less access to land and services and tend to lack political voice. Rich countries must increase their agricultural aid to at least $20 billion a year; it hovers now around 4 percent of overseas development assistance, just under $6 billion. Developing countries must commit more of their national budgets. African countries, for instance, have promised 10 percent of their budgets to agriculture. Vietnam invested heavily in its farming sector when it looked for economic growth and food security, and in 12 years turned itself from a country that had to import much of its food to be a major exporter. Last year poverty in Vietnam fell to below 15 per cent compared with 58 per cent in 1979. ‘This year’s G8 summit pledged $20 billion over three years to poor farmers and consumers. This sounds generous but it equates to just $2 per hungry person per year. ‘However, the problem of hunger and poverty in a climate-changing world will not be solved simply by throwing more money at fertilizer, higher-yielding seeds and big irrigation schemes. These things are important but are not always sustainable or what small-scale farmers actually need. We cannot maintain increased food productivity in a low-carbon and resource-scarce world simply by further intensifying today’s farming industry. ‘Agriculture needs to be rebuilt along entirely different lines and poor farmers and countries made central to that change. Countries must invest in farmer-driven extension schemes and social safety nets to help the poorest people to buy food locally from small-scale farmers and traders. There is enough food grown in the world for everyone. And yet we remain stuck in a food crisis. ‘Hunger is caused by poverty and inequality, not scarcity. For the past two decades, the rate of global food production has increased faster than the rate of global population growth. The world already produces more than 1½ times enough food to feed everyone on the planet. That’s enough to feed 10 billion people, the population peak we expect by 2050. But the people making less than $2 a day – most of whom are resource-poor farmers cultivating unviably small plots of land – can’t afford to buy this food. ‘In reality, the bulk of industrially-produced grain crops goes to biofuels and confined animal feedlots rather than food for the 1 billion hungry. The call to double food production by 2050 only applies if we continue to prioritize the growing population of livestock and automobiles over hungry people. ‘Agroecological methods that emphasize rich crop diversity in time and space conserve soils and water and have proven to produce the most rapid, recognizable and sustainable results. In areas in which soils have already been degraded by conventional agriculture’s chemical ‘packages’, agroecological methods can increase productivity by 100-300 percent. ‘This is why the UN Special Rapporteur on the Right to Food released a report advocating for structural reforms and a shift to agroecology. It is why the 400 experts commissioned for the four-year International Assessment on Agriculture, Science and Knowledge for Development also concluded that agroecology and locally-based food economies (rather than the global market) where the best strategies for combating poverty and hunger.